This fire caused an evacuation order of neighboring Princeton and took almost two weeks to be lifted as firefighters worked to contain the blaze. Elephant Hill is the largest fire burning in British Colombia today, with an extent close to 200,000 acres. The images on the map were captured on the 9th of August, more than a month after fire was initially spotted. Hundreds of firefighters have been deployed to fight the spread of the fire, and thousands of residents have been evacuated at various points in the past two months. The Thompson Nicola Regional District provides daily video updates on the status of the fire. Lightning is the suspected cause of this wildfire, burning near Dawson Creek above where it feeds into Kinbasket Lake at the foot of Brown Mountain. This is a small fire in an extremely remote part of BC, one of over a thousand identified so far in 2017. At the far northern end of Adams Lake, surrounded by unnamed service roads, a small forest fire was caught by satellite images in early August. The South Monte Lake fire was contained within a few days of being spotted by 26 firefighters, two helicopters, and one air tanker. The Little Fort fire caused an evacuation of several nearby towns after a lightning storm passed through. At the remote eastern edge of Dunn Peak Protected Area, a fire of unknown causes threatens several nearby structures. A 5-member Incident Management Team and water tender along with 20 firefighters and a helicopter have been assigned to contain the fire. First spotted late in mid-July, the Chezacut Ranch fire combined with a second fire a month later, the Tautri Complex fire. A large active fire continues to burn halfway between Alexandria and Soda Creek, having already covered more than 5,000 hectares. The first flames of this remote fire were caught on satellite imagery in late July, but the blaze remains small. One of our colleagues lives in British Columbia and recently shared a map with the team of the many devastating wildfires affecting the region. That got us thinking--could we take a closer look at the effect these wildfires were having? So we whipped up a forest fire change detection model based on our good friend Jarlath O’Neill-Dunne’s work, and threw together a quick interface for browsing the results of the model. A full write up of how we built this application is forthcoming on our blog. 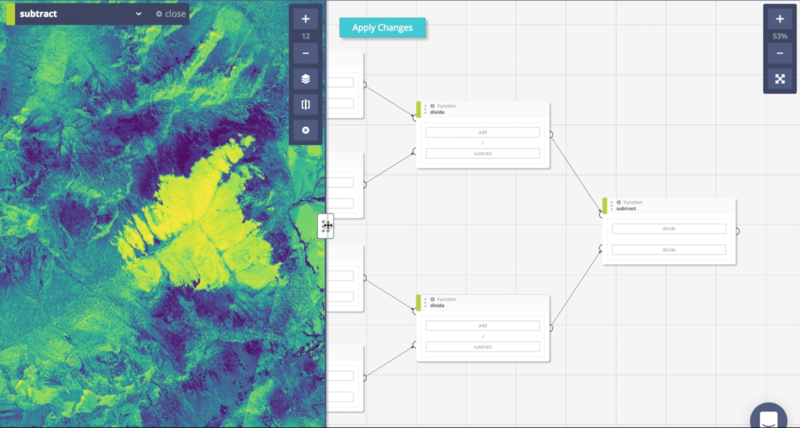 At Raster Foundry, we build web tools for quickly and repeatably turning earth imagery into information. This application was built on top of our API in just a couple of days without ever downloading a single sattelite image. If you're curious about how Raster Foundry could help your business better monitor and respond to changes on the ground, drop your email in the form to the left or reach out directly at info@rasterfoundry.com. Planet is designing, building and launching satellites faster than any company or government in history. They use commodity consumer electronics to build highly capable satellites at drastically lower costs. Their satellites image every location on earth, every day, at high resolution — providing a vital new data source that has never before been available. Check them out to learn more about how Planet data enables analysis like the kind you see on this website.